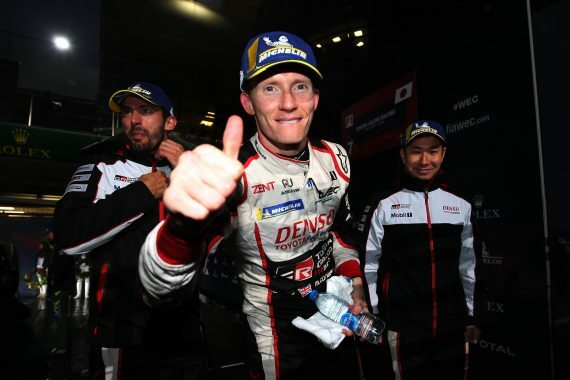 Mike Conway and his #7 TS050 HYBRID won their second consecutive race, after battling challenging weather conditions and close competition to claim victory in Shanghai and have now closed the gap in the drivers’ World Championship to just five points with three races remaining. After taking victory last time out in Japan at the Six Hours of Fuji, Mike and his teammates, Kamui Kobayashi and José María López, were looking to continue their good form into Shanghai and to close the gap in the World Championship standings to the sister #8 car. Mixed weather conditions set the scene for Friday with regular periods of rain creating challenging conditions for all cars, along with recent adjustments to the balance of performance in LMP1 setting the scene for a close battle with the privateer teams. In the slightly drier conditions of free practice one, and on the hybrid intermediate tyres, Mike and the #7 TS050 finished the first session of the weekend in 2nd place behind the sister #8 car. The team focused its efforts on fine-tuning the aerodynamic, mechanical and hybrid settings for the specific demands of the 5.451km Shanghai circuit. As rain fell on the Shanghai International Circuit, Mike Conway and his #7 crew recorded the quickest lap of the wet afternoon session, setting a best lap time of 2:02.259 on the wet weather tyres. With the challenge from the privateers teams being raised in Shanghai, with more fuel available for this race, plus the fuel and weight advantages imposed for the last race in Fuji, the non-hybrid cars showed strong performance potential and the top four cars were separated by only 0.676secs in second practice. The rainfall on Friday meant that Saturday morning’s one-hour long final practice was the only opportunity to fine-tune dry weather set-ups for qualifying. Here, the challenge from the privateers was apparent as Mike and his #7 crew finished in 4th place, with the two TS050’s finishing behind the two Rebellion Racing LMP1s topping the timesheets. For qualifying, Kamui began the session for the #7 team and immediately put the #7 crew at the top of the leaderboard. With rain forecast for the race, there was no incentive to restrict new tyre usage so when Mike headed out for his flying lap he was also able to benefit from a fresh set of Michelin rubber for his flying laps. Track conditions were improving rapidly, and lap times were dropping every lap, so the team took the unusual step of asking Kamui to return to the cockpit in the final minutes to take advantage of the track conditions to go even quicker. On new tyres again and using qualifying-specific hybrid boost settings, Kamui Kobayashi marginally won the battle for pole position as TOYOTA GAZOO Racing secured a 100% pole position record in 2018. In one of the tightest sessions of the year, the #7 TS050 won the battle for pole from the sister #8 car and by the end of the session, the top four were separated by less than a second. Rain on Sunday morning forced the race to start behind the safety car due to treacherous track conditions but even driving at a reduced speed proved difficult and an accident further down the field prompted a red flag, with the pole position #7 TS050 HYBRID leading from the sister #8 car. A minor improvement in conditions allowed a short green flag period around the 70-minute mark and during this José ran slightly wide in the #7 which allowed Sébastien Buemi in the sister car to claim the lead for the #8, prior to another safety car and red flag sequence. Soon after the two-hour mark, the race re-started behind the safety car again. The TS050 HYBRID required a refuelling stop on lap 27, during which Kamui took over the #7 and were temporarily positioned towards the back of the field until other cars too made their pit stops. 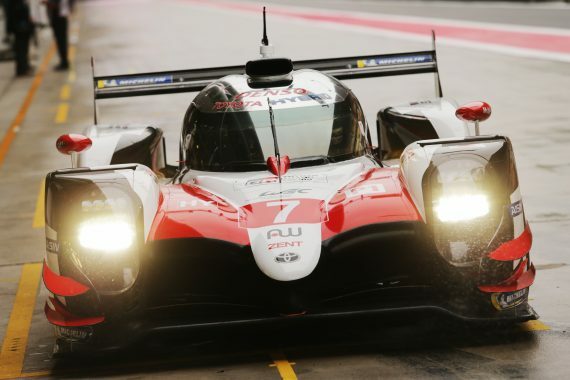 When the running order stabilised around half distance, Kamui was behind the #7 but had lost time in a congested pit lane to sit in fourth place but soon he fired his way past the non-hybrid LMP1s to be placed in second. The next safety car, for a damaged LMP1 on the start-finish straight, came with just over two hours remaining. Kamui brought the #7 TS050 in for a fuel stop on lap 55 and the team focused on keeping the race lead for as long as possible considering the successive safety car and red flag periods. During these stops, the #7 was able to jump ahead of the sister car to take the lead of the race once again. As track conditions slowly improved, the final driver change with around 70 minutes remaining saw Mike take over the leading #7. With the sister car catching and the weather looking to take a turn for the worse again, Mike held on in the final 30 minutes to win by the slim margin of 1.419 seconds. This entry was posted	on Wednesday, November 21st, 2018 at 7:30 pm	and is filed under Featured, Motor Racing. You can follow any responses to this entry through the RSS 2.0 feed. Both comments and pings are currently closed.